What comes to mind when you mention the words labyrinth or maze? Getting lost in the maze at Hampton Court? Running between high hedges? The Greek legend of Theseus battling with the Minotaur in the labyrinth at the Palace of Knossos? For me high rise parking garages are the labyrinths of our time, with their low ceilings and many levels of parked cars as you spiral up or down ... or get lost trying to find your car. The key ingredient badly missing here is the spiritual center or sacred heart that makes the journey worthwhile. Mazes and Labyrinths are related. However, they are distant relatives rather than siblings. Labyrinths came first. Labyrinths even existed in the Stone Age! They appear all over the world. From stone labyrinths on the Swedish Coast to meander patterns in Siberia and the dreaming tracks in the Australian bush . 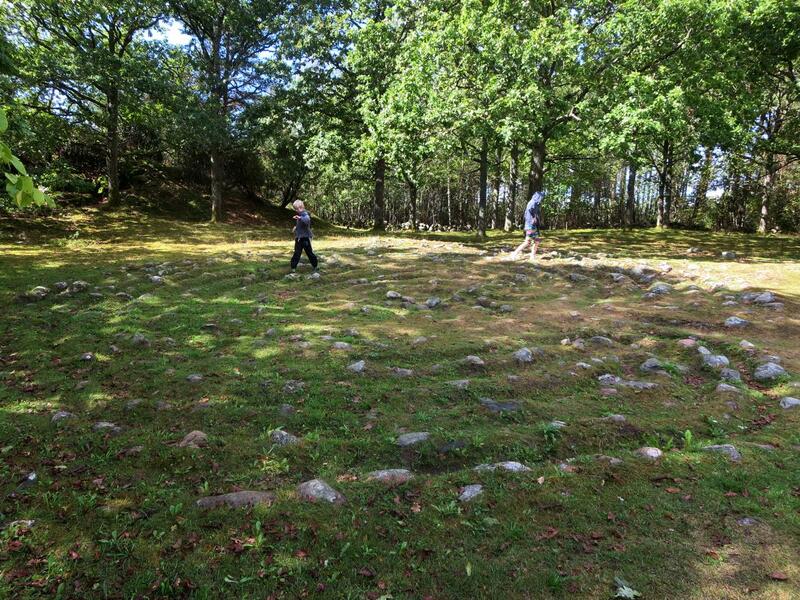 This labyrinth is situated on the Swedish West coast in the province of Bohuslan, just north of Grebbestad. 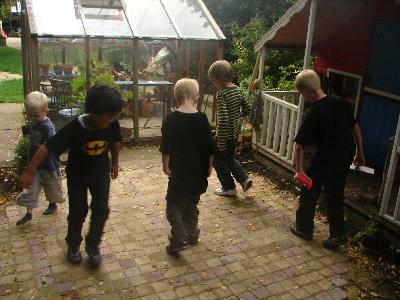 This is an area famous for rock art and prehistoric monuments. Like many Scandinavian labyrinths this one is located close to the sea (you smell the sea and hear the sea-gulls as you walk it!) and was probably walked by fishermen before they headed out to sea. There are over 500 ancient stone labyrinths documented in Scandinavia and Iceland and a few cut in turf in England, Germany and Poland. Some are situated close to prehistoric burials or grave fields and it is claimed that some date from The Bronze Age. Numerous legends and stories have been collected and recorded about these labyrinths. 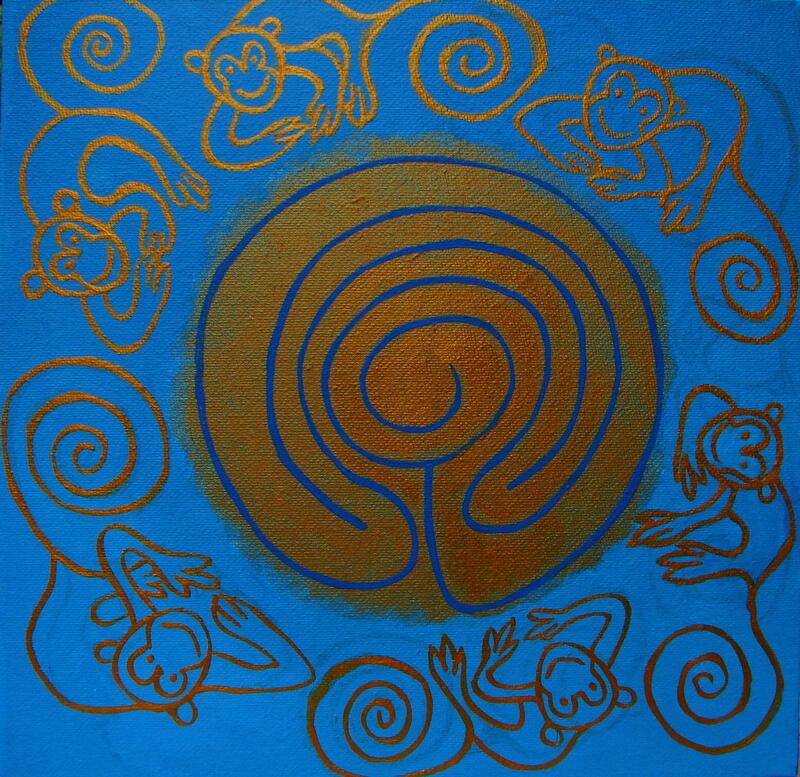 Fishermen walked labyrinths to appease the gods of the winds or sometimes to trap trolls or harmful spirits (e.g. malicious land wights) or somehow tie up bad luck in the labyrinth. Apparently when mariners were delayed by bad weather they would build stone labyrinths so the wind would get caught up in the labyrinth and reduce in strength so they could set sail! Author Nigel Pennick (whose work informs some of the text on this webpage) explains in more detail about labyrinth fishing magic. Fish weirs and fish traps on rivers and in tidal areas are made from stones, sticks, wattles, basket work and timber, either with or without nets, all over Europe. Coastal magical labyrinths for the entrapment of fishing with nets from ships may have followed on from the construction of actual coastal fish labyrinths, using the form of the unicursal labyrinth rather than shapes suitable for catching fish. The labyrinths on the coast of The White Sea in Russia are in the area of of spawning grounds where seasonal fishing was carried out. 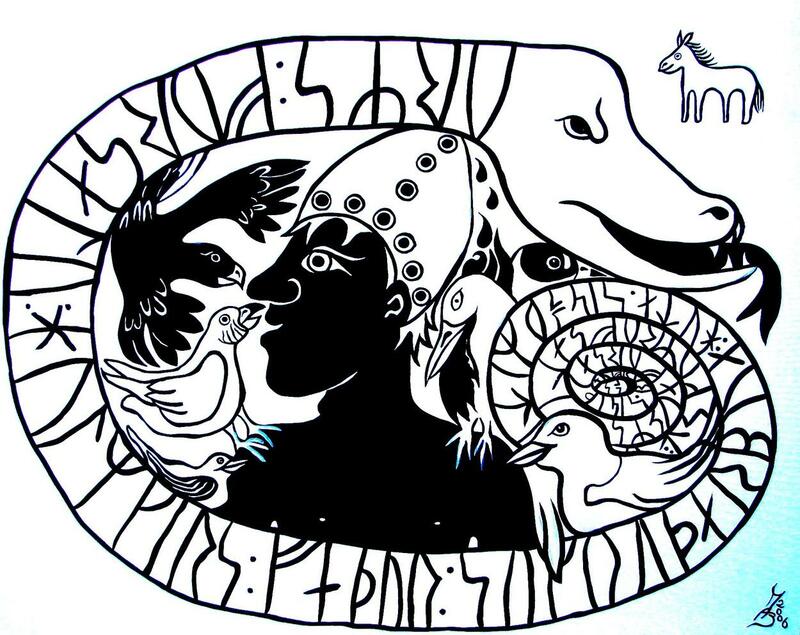 In Northern Sweden and Finland, labyrinths were used by Sami herdsmen as a means of magical protection of their reindeer from attacks of wolverines. There has been a lot of speculation regarding the origin of the Greek word 'labyrinthos'. Some people it claims from the word 'labrys', meaning 'house of the double ax'. This is debatable, as 'labrys' isn't an ancient Greek word, it's derived from another (Carian) language. The literal meaning of the word 'labyrinthos' is structure of large stones. It's unclear who 'invented' the labyrinth. Maybe someone doodling in the dust with a stick hit upon it and it spread? Or some nature spirits showed someone how to draw one? We don't know. The design appears all over the world! 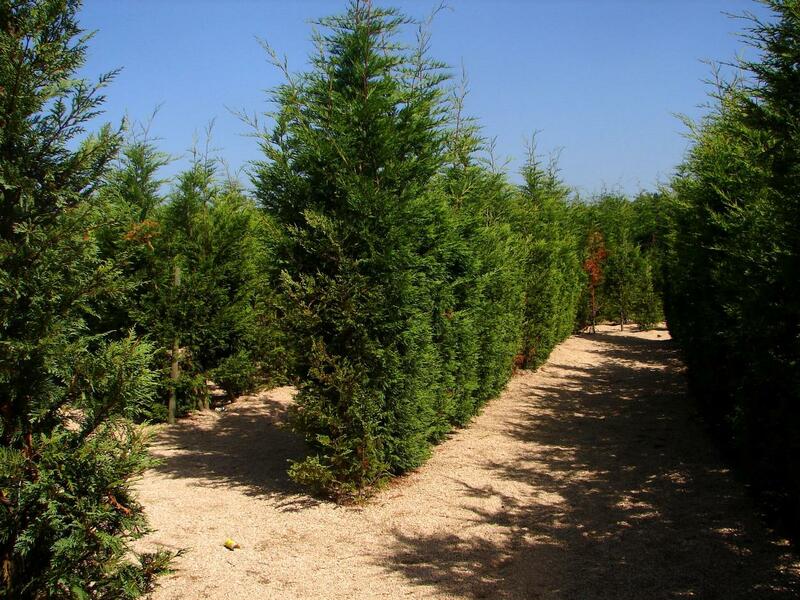 Between the 16th and 18th centuries, the first hedge maze 'craze' swept across Europe. Elaborate maze gardens were created in the grounds of palaces and public buildings. These mazes were associated with romance, secret trysts, deception and the changing fortunes of love. 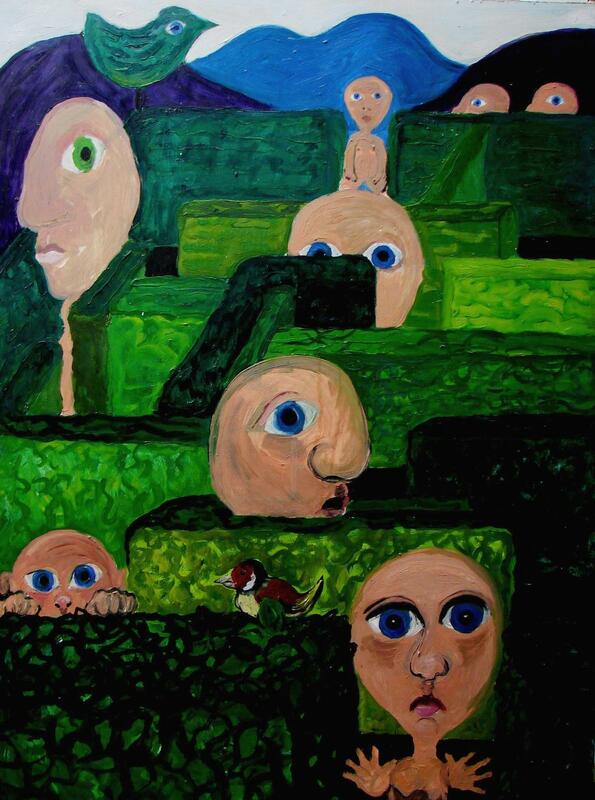 Mazes are clearly associated with worldly concerns whereas labyrinths have otherworldly dimensions. They are a device for going deep. 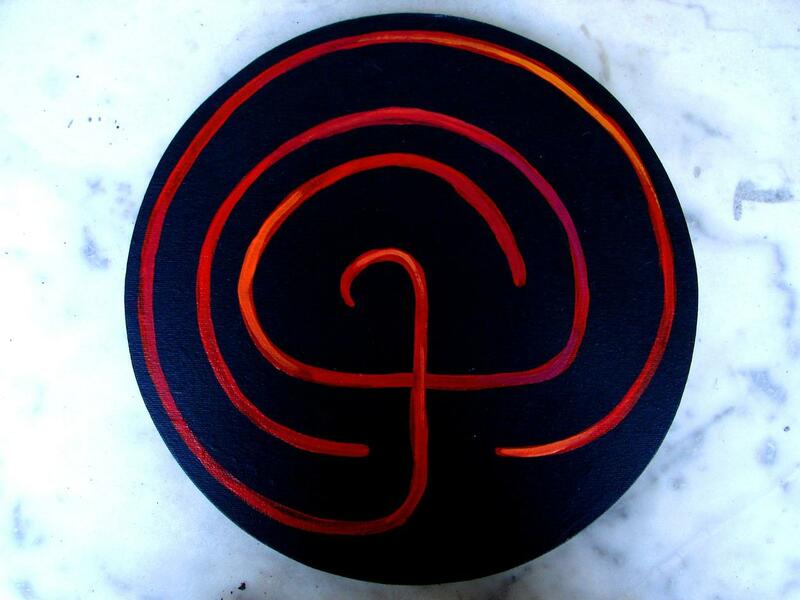 This is why I use the labyrinth as a living glyph and Map To The Great Within in my SACRED ART COURSES. Tattoo pattern designed to ease labour pains and ensure an easy birth! Today in Tamil Nadu protective labyrinthine designs, called threshold or kolam patterns, are still placed on doorsteps to keep unwanted spirits out. These elaborate patterns are traced in rice flour on a freshly scrubbed doorstep. They serve as an offering to Lakshmi: the goddess of rice, earth and wealth. They are supposed to stop evil spirits from entering and to bring good fortune to those within the dwelling. Certain labyrinths are designed for easing labour pains and ensuring an easy birth. 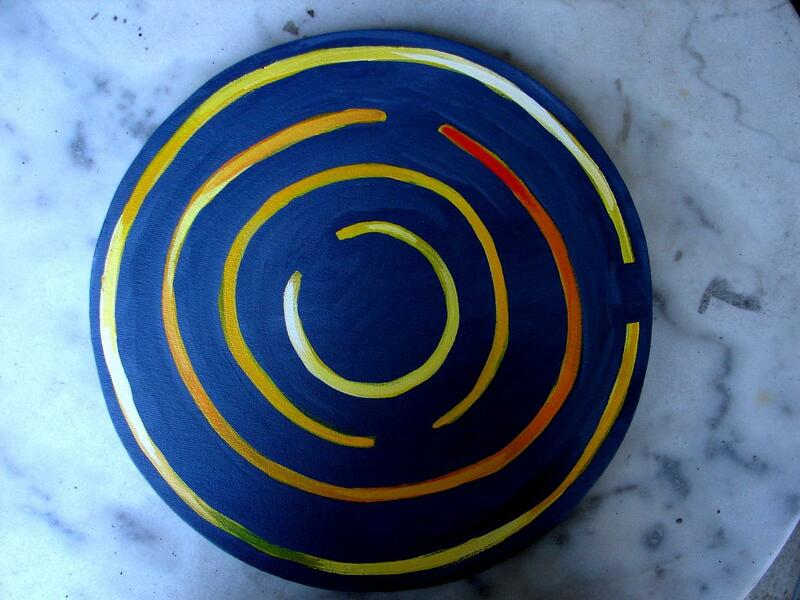 A pregnant woman would put saffron on a metal plate and draw a labyrinth in it with her finger. She then rinsed the plate and drank the water. 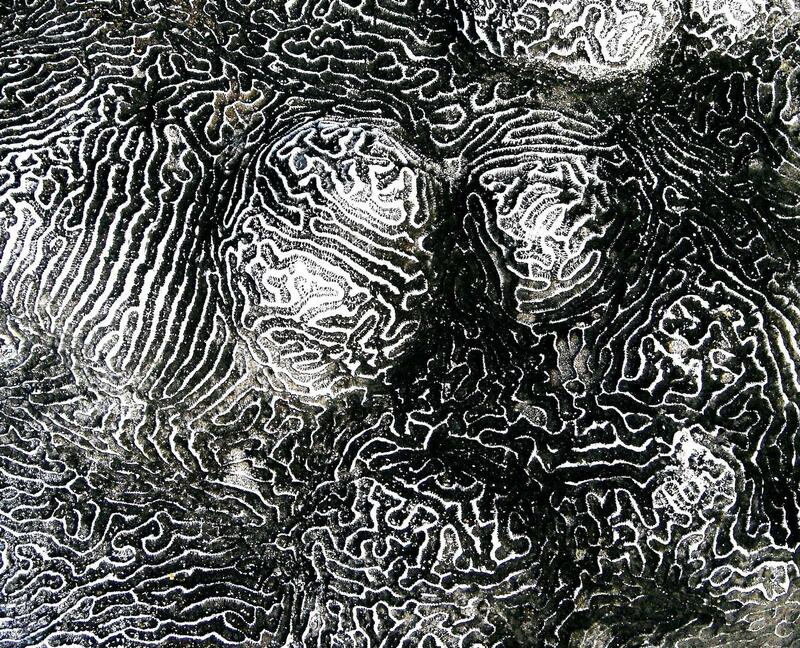 Labyrinths have also been found as tattoo patterns in southern India, in the design pattern books of wandering Korawa tattoo artists (look left). In the great Ramayana epic from India, the demon Ravana abducts Sita, wife of the hero Rama. He holds her hostage in an impenetrable fortress. An army of monkeys then helps Rama attack the labyrinthine fortress and he manages to rescue his wife. 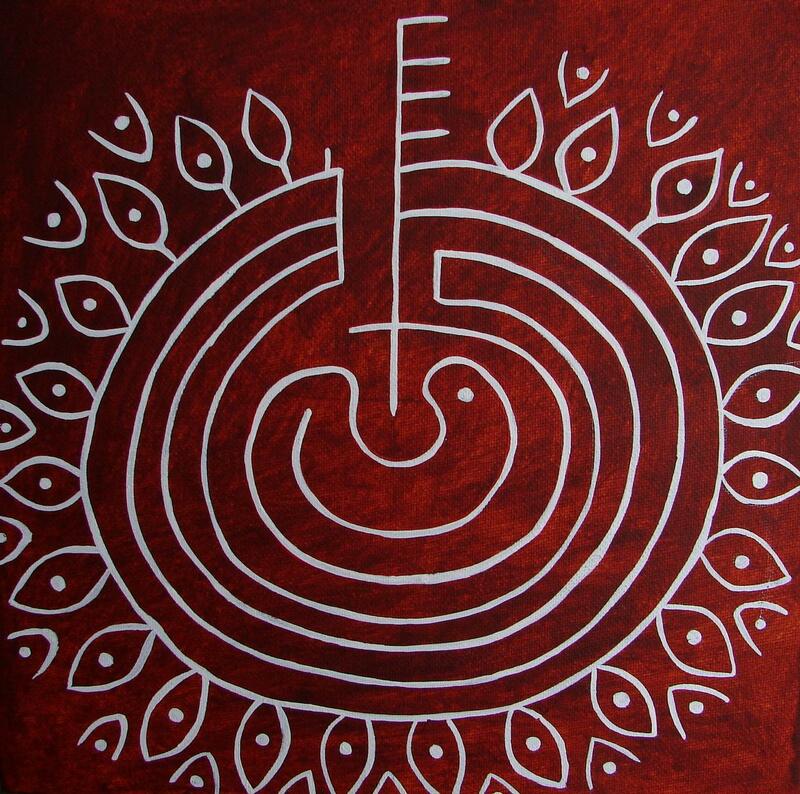 The labyrinth at the centre of this painting is a design known as the Chakra-vyuha. Literally this means a magical troop formation created to to ensure victory in battle in the Mahabharata epic. Labyrinthine and spiraling forms often occur in nature: the gill patterns of fungi and the folds of coral, not to mention the underground passage ways of ant or termite colonies. In Peru the Nazca people carved very large figures into the earth about 1500 years ago. These figures are so huge, you need to go up in a small airplane to see the shapes formed by the lines. It is now believed that these figures were walked as part of processions. If this is true, their shape and use makes them something akin to labyrinths. 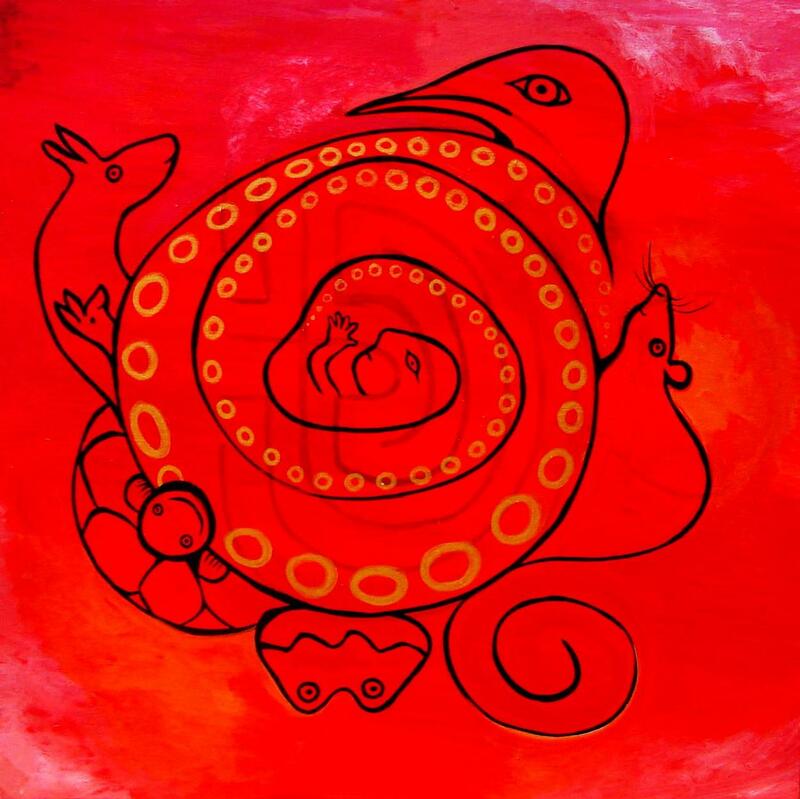 In more than one culture labyrinths symbolize a child growing inside the a mother's womb and/or birth: the one way passage out of the womb. There are pictures of labyrinths in several Indian manuscripts from the 17th century onwards (mostly from Rajasthan and Gujarat). 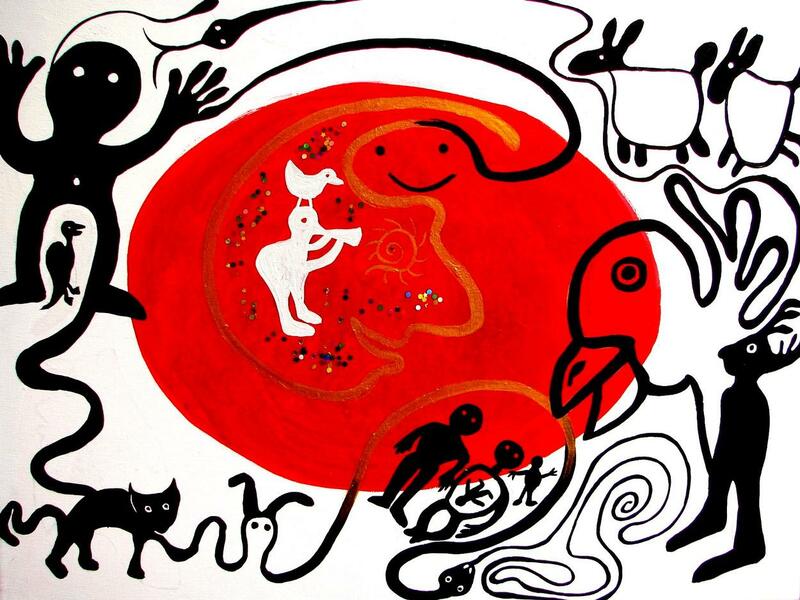 Many labyrinths appear on Tantric drawings as protective magical charms. 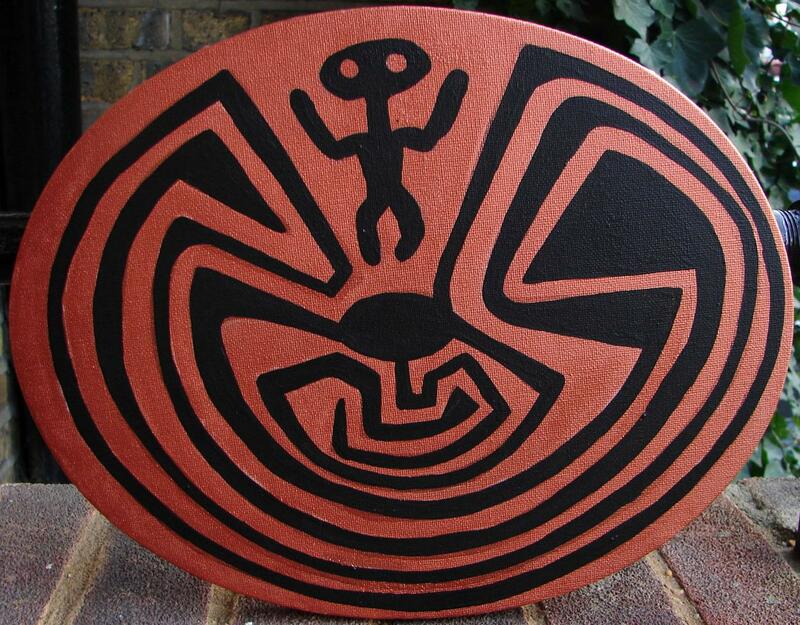 In the past labyrinths were undoubtedly used in shamanic rituals: vision quests , seasonal celebrations and so forth. 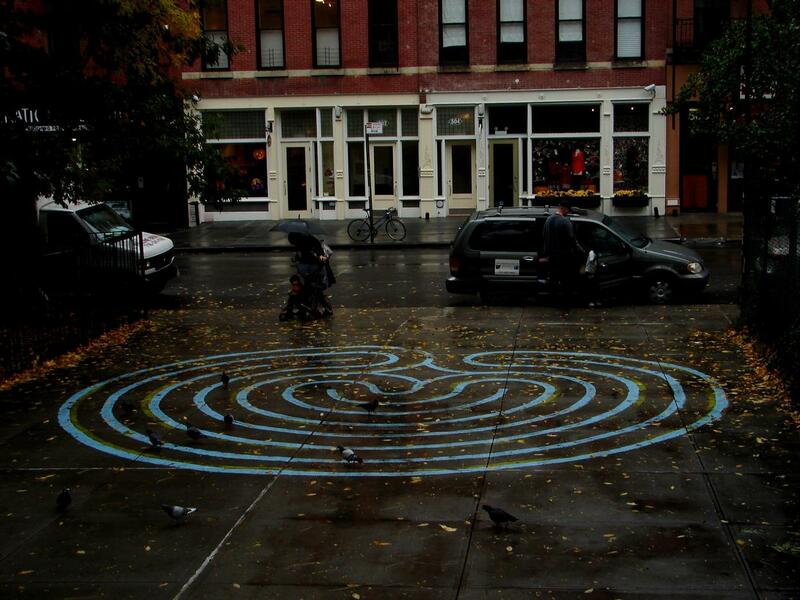 Labyrinths are calming and fascinating to look at. They are useful in inducing trance-like states in people who look at them or walk them. 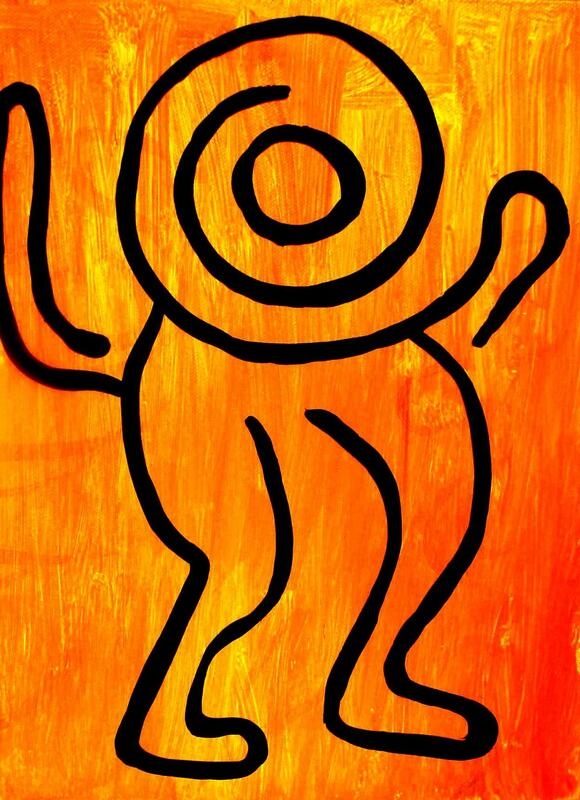 The first creature to ever be associated with a labyrinth was the Minotaur . This ancient Greek myth was written down by the Greeks in the 8th century BC. The Minotaur was a monster, half man and half bull, trapped inside a prison so intricate that no one who entered it could escape. Every nine years young men and maidens were sacrificed to the monster. The Minotaur was the offspring of an unholy union between a Queen of Crete and a white bull. Anyway, one day a young hero appears on the scene: Theseus. A princess called Ariadne gives Theseus a clue of wool to unwind as he enters the labyrinth, so he can find his way back out. Theseus defeats the Minotaur and escapes from the Labyrinth. (This story does not have a 'modern Walt Disney ending' sadly: they do not live happily ever after. Theseus takes Ariadne with him aboard his ship, then abandons her on a beach somewhere as he moves on to new pastures and new adventures).? In the past our forebears saw the bull as a symbol of virility and fertility. The bull was slaughtered and his blood renewed the earth. This very simple story of death and resurrection is an analogy for the seasons. On a deeper level it represents a fundamental truth of human existence: new life arises from the death of the old. 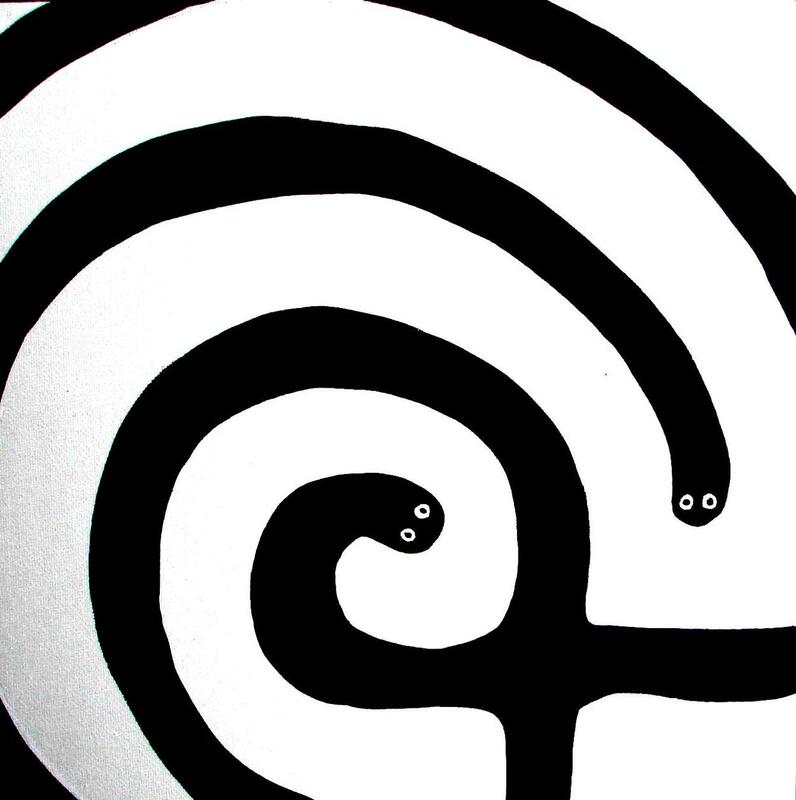 As mentioned earlier: in Scandinavia we find more labyrinths than anywhere else in the world! All are made out of stone. They are called Troy Towns. Sometimes they are referred to as Maiden's Dance. There are two components to the folklore associated with them. 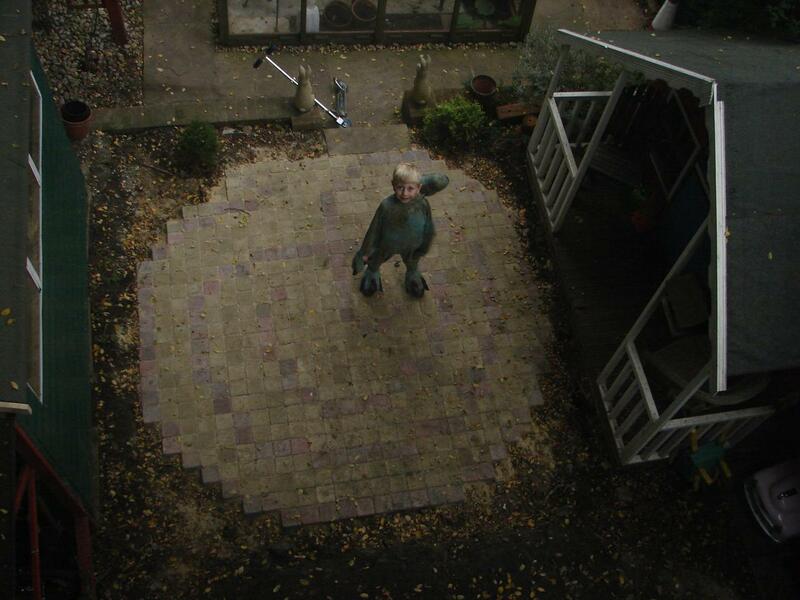 One is a maiden standing in the middle of a labyrinth as a man dances or runs towards her. 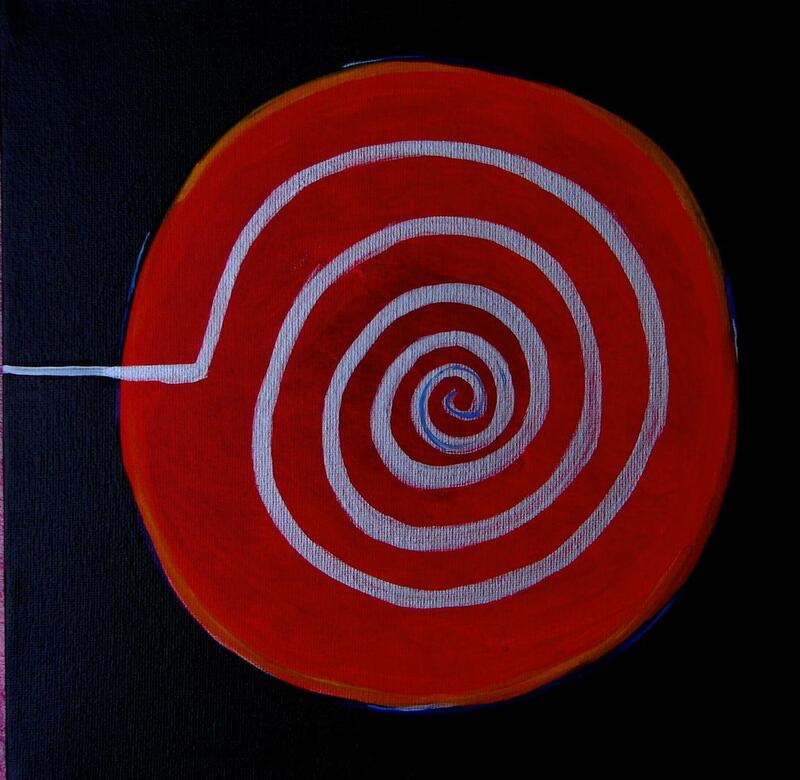 The second is about labyrinths as a protective and magic device. Scandinavian labyrinths are also in close proximity to places of execution and burial grounds, indicating a connection to the underworld and rites of the dead. 'In the beginning there was only darkness, inhabited by Earth Maker and Buzzard. Earth Maker rubbed dirt from his skin, from which grew a greasewood brush. A Buzzard created the mountains and rivers with the passage of his wings, the Spider People sewed the earth and the sky together. The Tohono O'odham People of southern Arizona are well known for their woven baskets featuring a 'Man in the Maze design'. They use the labyrinth extensively in their mythology and craftwork. 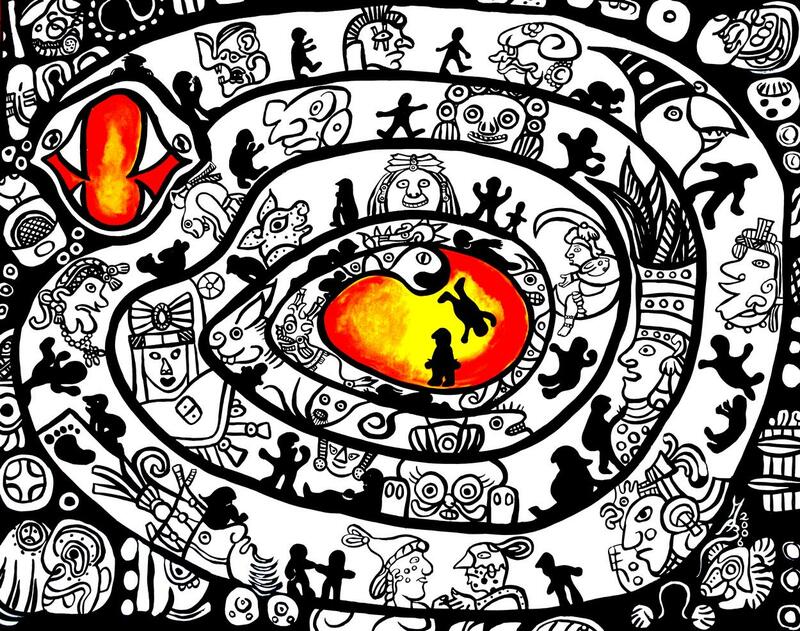 It appears as a motif on e.g. silver jewellery as well. In time Earth Maker brought about a race of people in the desert. They lived for several generations, but they all became sinful, except for one: Litoi, the Elder Brother. 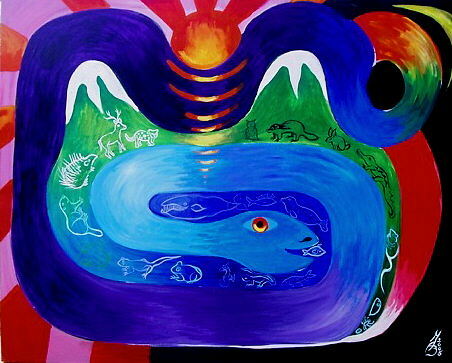 Earth Maker told Litoi that a flood would kill all people and placed him high up on the sacred mountain Baboquivari. Litoi witnessed the disaster and helped create the Hohokam people. In time these people turned on Litoi and killed him. His Spirit fled back atop Baboquivari. From time to time his spirit, in the form of a small man, sneaks into villages and takes things from people. Despite their attempts to catch him, the twisting path he takes always confuses them! Thus in the labyrinth one can see Litoi on the pathway and trace the mysterious and bewildering turns he makes on the journey back to his mountain home, Baboquivari.' 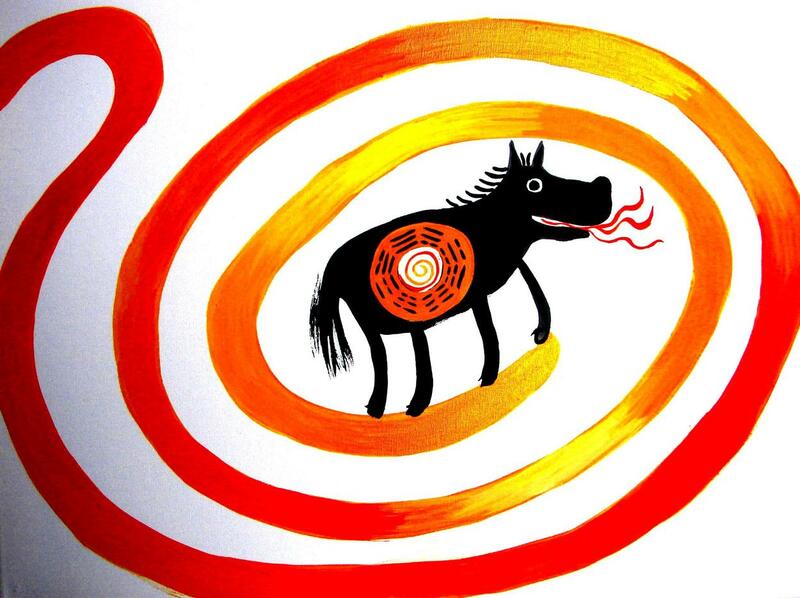 This is the Creation Myth of the Tohono O'odham people of southern Arizona. They are well known for their woven baskets decorated with a design known as The Man In The Maze. 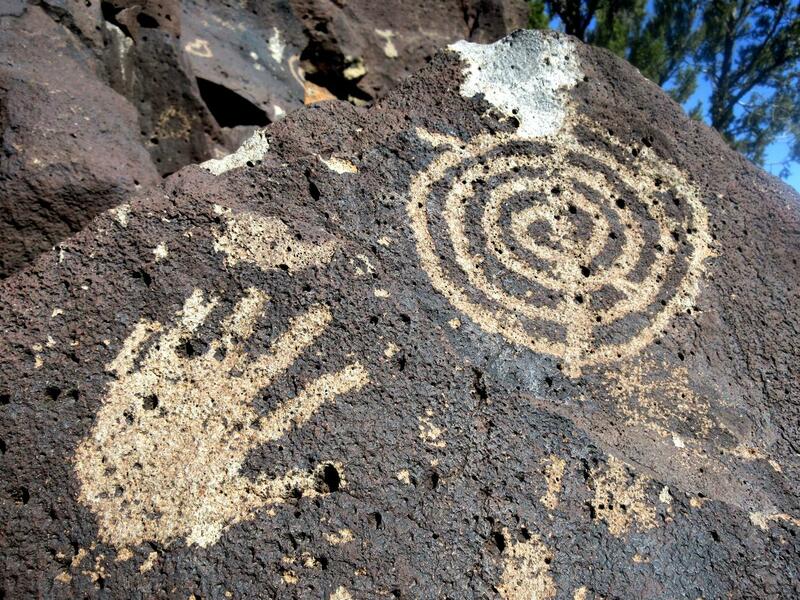 The Tohono refer to the labyrinth as The House of Litoi. In their creation myth the path to Litoi's house is so long and winding that no one has ever managed to find its exact location. 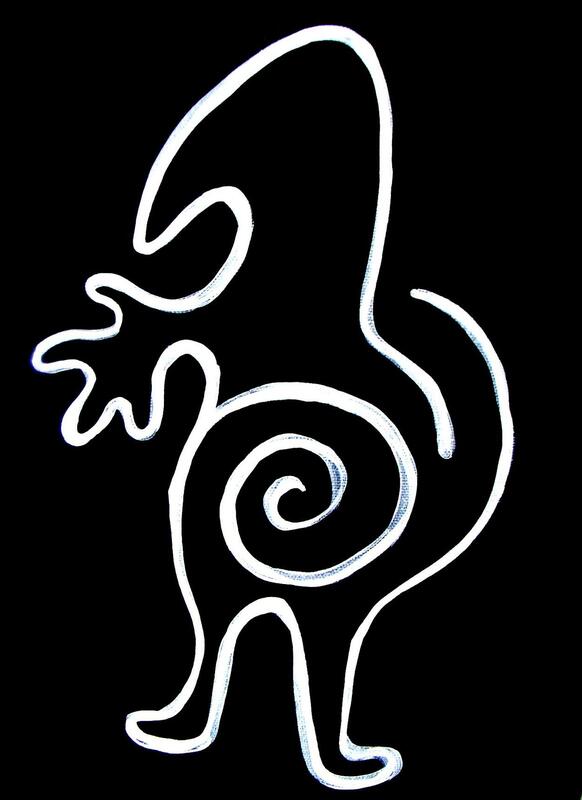 The small figure standing at the entrance of the labyrinth is Litoi (or Siuku). He alone knows the safe way back to his home! The Zuni are a native American tribe known for their pottery (as well as their fetishes and carved animal figurines. I personally own several! Their pottery was made by the women and had sacred significance. Pots and bowls were considered living beings. The pattern on them always began with a circling line, but it was broken so that the spirit of the vessel and anything it contains could escape. Closing the line would also signify the closing of the potter's life, i.e. meaning that she would die! Then I came across a picture of a clay face that is in the British Museum. It showed the face of the monster, Humbaba, Guardian of the Cedar Forest, made out of an unbroken path winding in on itself: a labyrinth, by all means and purposes! 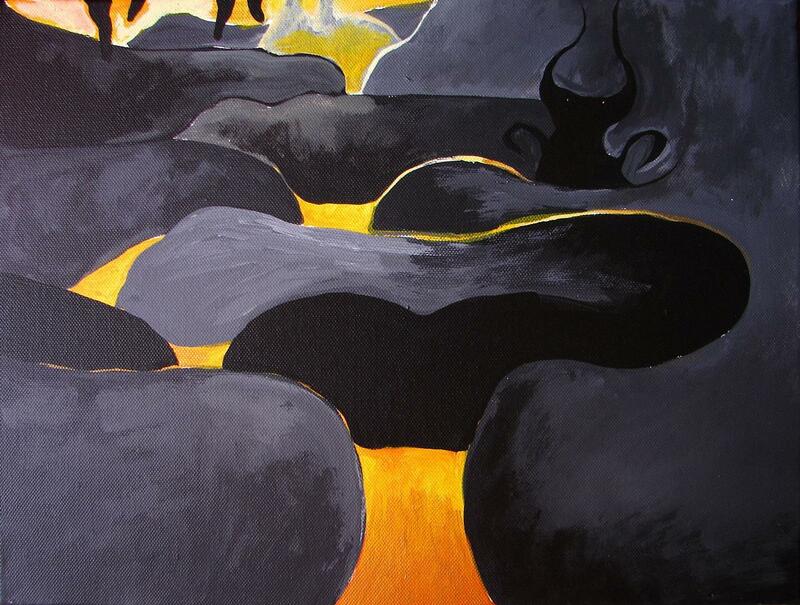 And that was the idea behind this painting: painting the quest of the heroes and the face of the monster as a labyrinth. I read the Epic of Gilgamesh recently and was fascinated by the passage where two heroes, two young men, set out to slay a monster. However, by doing so they invoke the wrath of the gods and bring down disaster on themselves. Gilgamesh is the story of a hero's journey. Gilgamesh is the young king of Uruk who ventures to the Cedar Forest, accompanied by his servant and best friend Enkidu. The Cedar Forest is guarded by a terrifying monster, called Humbaba. At the crucial moment in the confrontation, Humbaba begs for mercy. Gilgamesh is prepared to spare his life, but Enkidu insists they go ahead and kill Humbaba. This invokes the wrath of the gods and decides the future. Enkidu is doomed to die because he interfered with the natural order of things. The monster had his place in the natural order of things, he had an important job to do! Enkidu's death leaves Gilgamesh devastated by grief. Gilgamesh decides to set out on another journey: the quest for the secret of immortality. He seeks out a hermit who leaves at the edge of the world whose name is Utpanishtim. He is a Noah-like character who was granted the gift of immortality as he was the only survivor of the great deluge. Utpanishtim tells him that life is short and death is final - there is no secret of immortality. Eventually Gilgamesh returns to Uruk as a much wiser and more compassionate king. In terms of Mythology, the authorship of the I Ching (Book of Changes) is attributed to China's first emperor. He was a mythological figure called Fu His (or Fu Xi), also called Pao His. He lived about 5000 years ago and was supposed to half man and half dragon. One day Fu His saw a dragon-horse rise from the Yellow River. On it's side were markings, which were recorded as the 'Yellow River Map' ('Ho Tu'). 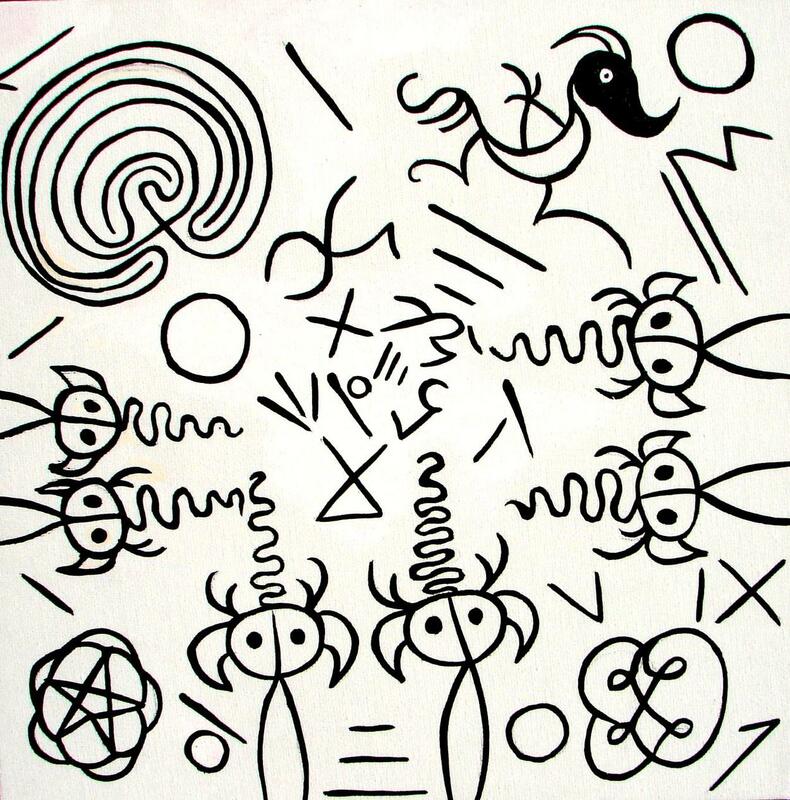 Fu Hsi interpreted the four directions of the Ho Tu in eight diagrams, consisting of geometric lines. These diagrams became the hexagrams that make up the I Ching or Book of Changes. It is likely that Kung Fu-Tze (Confucius) added commentary and created the book as we know it today. Historically speaking the I Ching probably developed out of earlier methods of divination, using tortoise shells or ox shoulder bones. (A red-hot poker was applied to cause a random pattern of cracks from which priests deduced meaning). Labyrinths are even found in churches. In medieval times pilgrims would have walked or crawled them as an act of penance. Perhaps they were trying to leave their sins behind in the winding coils! These labyrinths may have been a symbol as well for pilgrims journeying through strange territories and peril on their way to a spiritual center. < AND ONE DAY A SMALL MINOTAUR APPEARED IN MY OWN LABYRINTH!